Dubuque General Manager in Doghouse to Raise Money for Humane Society - Spahn & Rose Lumber Co.
John Cook, the General Manager of Spahn & Rose’s Dubuque location, is locked up—in a manner of speaking. He was thrown in the Dubuque Regional Humane Society’s doghouse, and he won’t be freed until contributors raise $2,000. 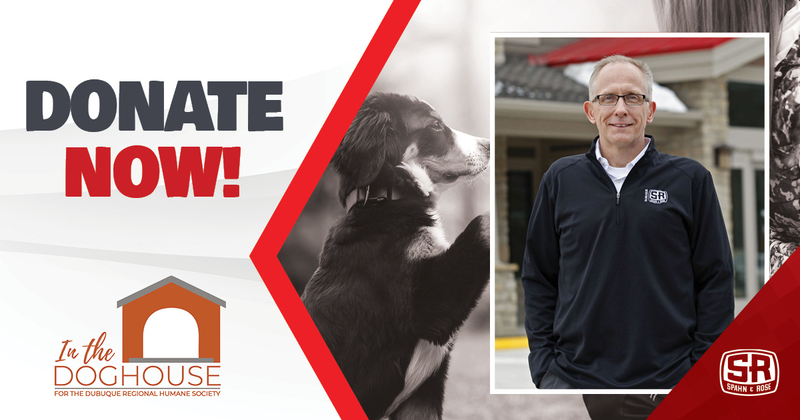 The “In the Doghouse” fundraiser runs throughout March; money raised will support the more than 2,700 homeless companion animals for which the Dubuque Regional Humane Society (DRHS) cares. Community leaders throughout the Dubuque area have been put in the doghouse, and donations to pay their “impound fees” will provide treatment, care and supplies for animals awaiting adoption. To pay Cook’s impound fee, visit the DRHS’s In the Doghouse page. The goal is to reach $2,000 by the end of March. $500 allows compassionate care for three dogs for a week. Spahn & Rose has been a strong supporter of the DRHS. In addition to monetary donations, Spahn & Rose gave the facility a shed in 2017.